Next to a barn, a tractor is probably the most evocative symbol of “farm” in America. When I visited Issacson Implement in Nerstrand the other day (good folks, BTW), I saw this little number. The price, I think, was $280,000. Nearly as much as we paid for our whole farm! 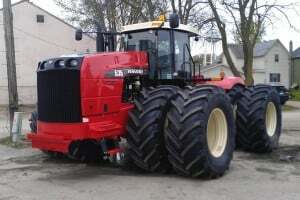 Obviously, it makes no sense for us to buy a tractor like this – and clearly there are tractors more appropriate to our farm – but it does prompt me to think a bit about the nature and scale of different kinds of farms. Nowadays, it’s common for a farmer in Minnesota to ‘run’ 1000 or more acres – some owned, some rented. And many of these farmers – at least around Sogn – seem to be growing mostly corn and soybeans. The number of anhydrous ammonia trailers on the roads earlier this spring suggest that most of what is grown is conventional: i.e. using chemical fertilizers, pesticides and herbicides. These have to be, then, high-dollar operations for which 400hp 4WD tractors are just tools of the trade. Makes quite a contrast to our little farm – and the farms of some of the folks I’m getting to know. 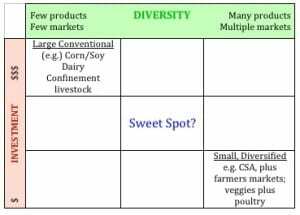 I’ve started to think of various kinds of farms on two axes of a grid: high dollar to low dollar (both investment and cash flow), and low to high diversity (for example, corn and soy rotation versus small farms that do poultry and eggs plus veggies and/or fruits for CSA and/or farmers markets). Now, if you want to do a large conventional corn and bean (or dairy, or confinement beef, pork or poultry) operation, you can get lots of help from the University’s Farm Business Management program or the Center for Farm Financial Mangement (e.g. this report). These folks have worked with thousands of farmers over the years and can help design a business plan, or tell you if your costs are too high, production too low, interest expense too high and so on: they can tell you a lot about how to run certain kinds of farm businesses because, in part, they’ve seen lots of other farmers doing almost exactly the same thing. But what about your small-scale diversified, sustainable or even organic farm? Where is the business model? How can someone running that sort of operation benchmark their operation or write a business plan? For these folks (and that includes our little farm) I can’t seem to locate any established benchmarks, and there seem to be few people who know the business side well enough to review the operation, business plan etc. This has at least two important effects. First, small diversified farmers appear to lack some useful tools that could help them run their businesses. Second, these same farmers often lack the information they need to finance their operations – in part because lenders or investors don’t have tools to evaluate a small diversified farm’s business plan. Now many of the small-scale early-stage farmers I’ve met recently are up to their necks in work already and record keeping and accounting – especially for their complex and diversified operations – are not top priorities. This leads to my query-du-jour: would gathering information about successful medium-sized, somewhat diversified farms (that is, in my suggested ‘sweet spot’, of which examples are rumored to exist in SE Minnesota and likely elsewhere) be a useful first step in establishing models and benchmarks to help farmers, lenders and, potentially, investors better understand and evaluate well-run sustainable farms? What do you think? Would this be a worthwhile project? Or is this information available somewhere and I’ve overlooked it? Suggestions, comments or advice will be most welcome! This work-in-progress has benefited from conversations with many wise people. I don’t know if they’d like to see their names here so, for now, I’ll just acknowledge their organizations: The Institute for Agriculture and Trade Policy, The Land Stewardship Project, Moonstone Farm, The First National Bank of Plainview, The Carrot Project, Renewing the Countryside, University of Vermont Extension, Midwest Organic and Sustainable Education Service (MOSES) and Featherstone Farm. This sounds like something right up her street. I think it’s a great idea (but then as an ‘information professional’ I would). It seems a shame that people who are passionate about growing food on a sustainable scale and without dangerous chemicals should have such an uphill struggle. Atina is great and I love her new book. Before we bought the farm I had a lovely evening with Atina and Martin, who is an incredible and entertaining storyteller and ethnic historian in addition to his farming knowledge. Great folks, great ideas. Glad her work is known out your way!